When people buy homeowner’s insurance, they usually intend for it to cover the home in which they live. That is also the insurance company’s expectation, and most of the time, that is the case. However, sometimes circumstances change and the home is left empty. For example, the family goes on a weeklong vacation or one that lasts a month or more. One member of the couple may accept a temporary job transfer that will last for a few years, and they may decide not to sell the home. In other cases, the family may move into a new home but find themselves unable to sell the prior one. In all of these cases, the home is rendered either unoccupied or vacant. This change in status can affect the insurance coverage. The standard homeowner’s policy provides coverage for losses caused by vandalism and malicious mischief. For example, the policy will pay for the repair and replacement of windows if the family comes home and finds all of the first-floor windows broken. 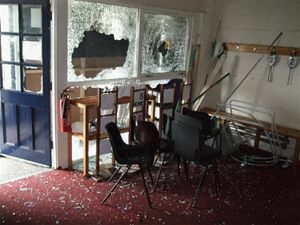 A reasonable person could conclude that vandals broke the windows. However, the policy will not pay if the home has been vacant for more than 60 days. Insurance companies design the policies and set the prices under the assumption that a home will be occupied. A vacant building is vulnerable to damage by vandals, so the companies have designed other policies to cover them. It is important to understand that a temporarily unoccupied home is not the same as a vacant one. A home is vacant if it has no occupants and contains no personal property (furniture, clothes, TVs, etc.) An unoccupied home still has personal property in it. The policy will pay for vandalism losses occurring to an unoccupied home. So, if a family moves out of a home and it sits empty while they try to sell it, vandalism coverage ceases on the 61st day of vacancy. If the family merely goes on vacation for three months, vandalism coverage remains in force. The question of whether a loss is an act of vandalism can sometimes be in dispute. For example, a Utah claim went to court after the insurance company denied payment for a fire caused by arson, claiming that arson is an act of vandalism. The court agreed with the company, finding that arson is a form of vandalism and therefore the insurance did not cover the loss. The standard policy specifically states that a home in the course of construction is not vacant, so the insurance should cover any associated vandalism losses. Also, since an insurance company does not consider a home with personal property to be vacant, coverage applies to any belongings damaged by vandals. However, an important coverage limitation applies to frozen water pipes. The policy will not cover damage caused by freezing of plumbing, air conditioning, heating and sprinkler devices. So, if the pipes freeze while the family is vacationing in Florida during the winter, the policy will not pay for the resulting water damage. This is not true if the homeowner has used reasonable care to maintain heat in the home or if he has shut off the water supply and drained the pipes. It is always a good idea to consult with an insurance agent when a home’s circumstances change, whether it is for sale or just an extended period of un-occupancy. The owners should consider loss prevention or control techniques, such as security systems and motion-sensitive lights. The combination of loss prevention and insurance may not eliminate the chance of a vandalism loss, but it will provide some peace of mind to those who must leave their most valuable investment.